In the 1990s the government attempted to reorganize the public transport system. New routes were introduced in 1994 and the buses were painted yellow. The system, however, had serious issues with routes overlapping, high levels of air and noise pollution, and safety problems for both riders and drivers. 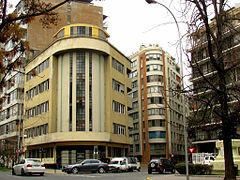 To tackle these issues a new transport system, called Transantiago, was devised. The system was launched in earnest on 10 February 2007, combining core services across the city with the subway and with local feeder routes, under a unified system of payment through a contactless smartcard called "Tarjeta bip!" The change was not well received by users, who complained of lack of buses, too many bus-to-bus transfers, and diminished coverage. Some of these problems were resolved, but the system earned a bad reputation which it hasn't been able to shake off. As of 2011, the fare evasion rate is stubbornly high. 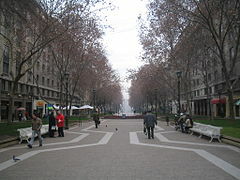 As of 2006, Santiago was home to 992,000 vehicles, 979,000 of which were motorized. This made up 37.3% of Chile's total vehicle count. 805,000 cars passed through the city, which is 37.6% of the national total or one car for every seven people. Arturo Merino Benítez International Airport has domestic and international services to destinations in Europe, Oceania, Asia and the Americas. In 2011 it was the ninth busiest airport in Latin America and the sixth busiest in South America by passenger traffic. It was the seventh busiest airport in Latin America by aircraft movements, serving 124,799 operations. 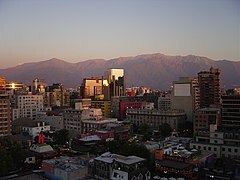 Its location in Chile's most populated area, as well as in the central part of the country makes of it an ideal main hub and maintenance center for most local airlines such as LATAM and Sky Airline. LATAM Airlines accounts for approximately 82% of the airport's total commercial operations.The airport is owned by the Chilean government and has been operated since October 2015 by Nuevo Pudahuel, a consortium of companies formed by Aéroports de Paris (France), Vinci (France) and Astaldi (Italy). Air traffic control is handled by the Directorate General of Civil Aviation (Chile). Santiago International is the longest non-stop destination for most European carriers including Iberia, Air France, Alitalia and British Airways from their respective hubs in Madrid–Barajas Airport, Paris–Charles de Gaulle, Rome–Leonardo da Vinci–Fiumicino Airport and London–Heathrow Airport. In addition, LATAM flies to Frankfurta via Madrid. The airport is also South America's main gateway to Oceania, with scheduled flights to Sydney, Auckland, Easter Island, Papeete and Melbourne. The Santiago–Rome non-stop flight operated by Alitalia is the longest flight to ever fly out of this airport. Caracas (Spanish pronunciation: [kaˈɾakas]), officially Santiago de León de Caracas, is the capital and largest city of Venezuela, and centre of the Greater Caracas Area. Caracas is located along the Guaire River in the northern part of the country, following the contours of the narrow Caracas Valley on the Venezuelan coastal mountain range (Cordillera de la Costa). Terrain suitable for building lies between 760 and 1,140 m (2,490 and 3,740 ft) above sea level, although there is some settlement above this range. The valley is close to the Caribbean Sea, separated from the coast by a steep 2,200-metre-high (7,200 ft) mountain range, Cerro El Ávila; to the south there are more hills and mountains. 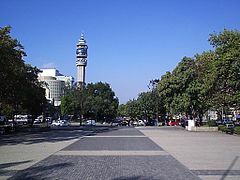 The Metropolitan Region of Caracas has an estimated population of 4,923,201.Strictly speaking, the centre of the city is still "Catedral", located near Bolívar Square, even though it is assumed that it is Plaza Venezuela, located in the Los Caobos neighbourhood. Chacaíto area, Luis Brión Square and El Rosal neighborhood are also considered the geographic center of the Metropolitan Region of Caracas, commonly called "Greater Caracas".Businesses in the city include service companies, banks, and malls. Caracas has a largely service-based economy, apart from some industrial activity in its metropolitan area. 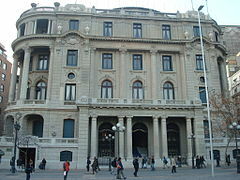 The Caracas Stock Exchange and Petróleos de Venezuela (PDVSA) are headquartered in Caracas. PDVSA is the largest company in Venezuela. Caracas is also Venezuela's cultural capital, with many restaurants, theaters, museums, and shopping centers. Some of the tallest skyscrapers in Latin America are located in Caracas.Caracas has been considered one of the most important cultural, tourist, industrial and economic centers of Latin America. The Museum of Contemporary Art of Caracas is one of the most important in South America. 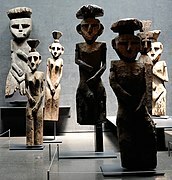 The Museum of Fine Arts and the National Art Gallery of Caracas are also noteworthy. The National Art Gallery is projected to be the largest museum in Latin America, according to its architect Carlos Gómez De Llarena. Caracas is home to two of the tallest skyscrapers in South America: the Parque Central Towers. It has a nominal GDP of 91,988 million dollars, a nominal GDP per capita of 18,992 and a PPP GDP per capita of 32,710 dollars. Being the seventh city in GDP and the seventh metropolitan area in population of Latin America.Caracas has the highest per capita murder rate in the world, with 111.19 homicides per 100,000 inhabitants. The interior of Galicia is characterized by a hilly landscape; mountain ranges rise to 2,000 m (6,600 ft) in the east and south. The coastal areas are mostly an alternate series of rías and cliffs. The climate of Galicia is usually temperate and rainy, with markedly drier summers; it is usually classified as Oceanic. Its topographic and climatic conditions have made animal husbandry and farming the primary source of Galicia's wealth for most of its history, allowing for a relative high density of population. With the exception of shipbuilding and food processing, Galicia was based on a farming and fishing economy until after the mid-20th century, when it began to industrialize. In 2012, the gross domestic product at purchasing power parity was €56,000 million, with a nominal GDP per capita of €20,700. The population is largely concentrated in two main areas: from Ferrol to A Coruña in the northern coast, and in the Rías Baixas region in the southwest, including the cities of Vigo, Pontevedra, and the interior city of Santiago de Compostela. There are smaller populations around the interior cities of Lugo and Ourense. The political capital is Santiago de Compostela, in the province of A Coruña. Vigo, in the province of Pontevedra, is the most populous municipality, with 292,817 (2016), while A Coruña is the most populous city, with 215,227 (2014).Two languages are official and widely used today in Galicia: Galician and Spanish. Galician is a Romance language closely related to Portuguese, with which it shares Galician-Portuguese medieval literature, and Spanish, sometimes also referred to as Castilian, which is used throughout the country. Spanish is spoken fluently by virtually all in Galicia, and in 2013 it was reported that 51% of the Galician population used more Galician on a day-to-day, and 48% used more Spanish. Victor Santiago, Jr. (born September 6, 1977), better known by his stage name N.O.R.E., formerly Noreaga, is an American rapper, singer and media personality. Santiago first rose to prominence as one half of the East Coast hip hop duo Capone-N-Noreaga (C-N-N), alongside fellow Queens-based rapper Capone. He would also have success as a solo artist with the singles "Superthug", "Banned from T.V. ", "Nothin'", "Oye Mi Canto" and "Mas Maiz". Pablo Ruiz Picasso (; Spanish: [ˈpaβlo piˈkaso]; 25 October 1881 – 8 April 1973) was a Spanish painter, sculptor, printmaker, ceramicist, stage designer, poet and playwright who spent most of his adult life in France. Regarded as one of the most influential artists of the 20th century, he is known for co-founding the Cubist movement, the invention of constructed sculpture, the co-invention of collage, and for the wide variety of styles that he helped develop and explore. Among his most famous works are the proto-Cubist Les Demoiselles d'Avignon (1907), and Guernica (1937), a dramatic portrayal of the bombing of Guernica by the German and Italian airforces during the Spanish Civil War. Picasso demonstrated extraordinary artistic talent in his early years, painting in a naturalistic manner through his childhood and adolescence. During the first decade of the 20th century, his style changed as he experimented with different theories, techniques, and ideas. After 1906, the Fauvist work of the slightly older artist Henri Matisse motivated Picasso to explore more radical styles, beginning a fruitful rivalry between the two artists, who subsequently were often paired by critics as the leaders of modern art.Picasso's work is often categorized into periods. While the names of many of his later periods are debated, the most commonly accepted periods in his work are the Blue Period (1901–1904), the Rose Period (1904–1906), the African-influenced Period (1907–1909), Analytic Cubism (1909–1912), and Synthetic Cubism (1912–1919), also referred to as the Crystal period. Much of Picasso's work of the late 1910s and early 1920s is in a neoclassical style, and his work in the mid-1920s often has characteristics of Surrealism. His later work often combines elements of his earlier styles. Querétaro has been recognized as the metro area with the best quality of life and as the safest city in Mexico and also as the most dynamic in Latin America. It is a strong business and economic centre and a vigorous service city that is experiencing an ongoing social and economic revitalization. Querétaro has seen an outstanding industrial and economic development since the mid-1990s. Querétaro metropolitan area has the 2nd highest GDP per capita among Mexico's metropolitan areas with 20,000 USD after Monterrey. The city is the fastest-growing in the country, basing its economy on IT and data centers, logistics services, aircraft manufacturing and maintenance, call centers, the automotive and machinery industries, and the production of chemicals and food products. The region of Querétaro has a rapidly growing vineyards agriculture and hosts the famous wine producer from Spain Freixenet. Wine production in Querétaro is now the second largest in Mexico after that of the Baja California region. All this has caused the city and the metropolitan area to attract many migrants from other parts of Mexico. Querétaro is the host for major corporations such as Bombardier Aerospace (an airplane manufacturing facility in Mexico), Kellogg's, Samsung Electronics, Daewoo, Colgate-Palmolive, Harman International Industries, General Electric, Michelin, Tetra Pak, Siemens Mexico, New Holland, Faurecia, ABC Group, Autoliv, TRW Automotive, Tremec, Valeo, Funai, Procter & Gamble, Nestlé, Pilgrim's Pride, Santander Bank's call center for Latin America, Mabe Mexico, Irizar, Scania, Hitachi, Kostal, Aernnova, Dana, Dow Chemical, Bose, Alpha Hilex, Saint-Gobain, Flex-N-Gate, and ThyssenKrupp, among others. The Santiago Bernabéu Stadium (Spanish: Estadio Santiago Bernabéu Spanish pronunciation: [esˈtaðjo sanˈtjaɣo βeɾnaˈβeu̯] (listen)) is a football stadium in Madrid, Spain. With a current seating capacity of 81,044, it has been the home stadium of Real Madrid since its completion in 1947.The Santiago Bernabéu is one of the world's most famous football venues. It has hosted the final of the European Cup/UEFA Champions League on four occasions: in 1957, 1969, 1980 and 2010 and hosted the second leg of the 2018 Copa Libertadores Final. The final matches for the 1964 European Nations' Cup and the 1982 FIFA World Cup, were also held at the Bernabéu, making it the first stadium in Europe to host both a UEFA European Championship, a FIFA World Cup final and a Copa Libertadores final. Santiago de Compostela (or St James of Compostella in English) is the capital of the autonomous community of Galicia, in northwestern Spain. The Cathedral of Santiago de Compostela (Spanish and Galician: Catedral de Santiago de Compostela) is part of the Roman Catholic Archdiocese of Santiago de Compostela and is an integral component of the Santiago de Compostela World Heritage Site in Galicia, Spain. The cathedral is the reputed burial place of Saint James the Great, the apostle of Jesus Christ. It is also one of the only three known churches in the world built over the tomb of an apostle of Jesus, the other two being St. Peter's Basilica in Vatican City and St. Thomas Cathedral Basilica, Chennai in India. The cathedral has historically been a place of pilgrimage on the Way of St. James since the Early Middle Ages and marks the traditional end of the pilgrimage route. The building is a Romanesque structure, with later Gothic and Baroque additions. The municipality extends over 1,023.8 square kilometers (395.3 sq mi), and contains the communities of Antonio Maceo, Bravo, Castillo Duany, Daiquirí, El Caney, El Cobre, El Cristo, Guilera, Leyte Vidal, Moncada and Siboney.Historically Santiago de Cuba has long been the second-most important city on the island after Havana, and still remains the second-largest. It is on a bay connected to the Caribbean Sea and is an important sea port. In the 2012 population census, the city of Santiago de Cuba recorded a population of 431,272 people. Santiago de los Caballeros or simply Santiago (English: Saint James of the Knights) is the second-largest city in the Dominican Republic, and the fourth-largest city in the Caribbean. 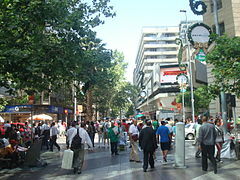 It is the capital of the Santiago Province and the major metropolis in the north-central region of the country. Its urban population reaches 550,753 inhabitants, and if rural areas are included its population rises to 691,262. Santiago is located approximately 155 km (96 mi) northwest of Santo Domingo with an average altitude of 178 meters (584 ft). Founded in 1495 during the first wave of European settlement in the New World, the city is the "first Santiago of the Americas". 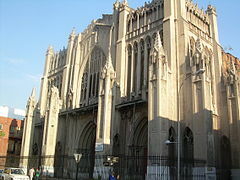 Today the city is one of the Dominican Republic's cultural, political, industrial, and financial centers. Due to its location in the fertile Cibao Valley it has a robust agricultural sector and is a leading exporter of rum, textiles, and cigars. 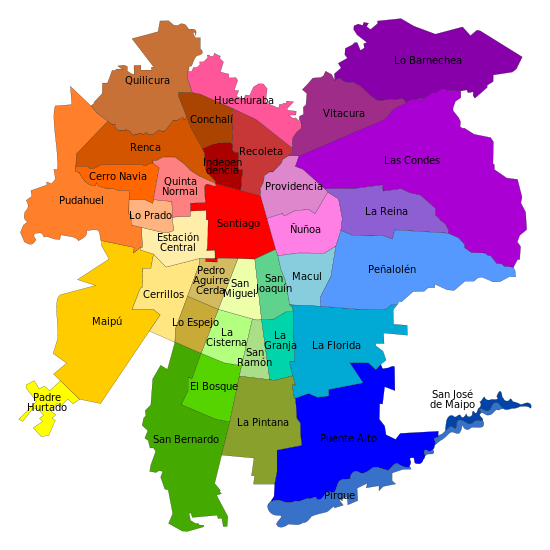 Santiago is known as "La Ciudad Corazón" (the "Heartland City").